I turn in some trepidation from my examination of the shelves. We’re in an unrecorded charity bookshop, not long open. A customer carrying a heavy rucksack with a week’s worth of camping gear is eyeing with misgivings the pile of fat paperbacks his wife is accumulating. Mr Howard, browsing undisturbed, is deciding on a beautifully-printed old devotional book. He may know something I don’t. I used to have a picture of Ross-on-Wye on the back of an old tea packet. The Towns of England. Felixstowe, I remember, too. Scenic sketches. Ross was a tall spire, a winding river, and a scribble of trees. And that’s how it still is. Sterner measures having failed, and the warning of Warner gone unheeded, they’ve decided to lull us. Ross-on-Wye is a lovely, picturesque place. We won’t get into mischief there. A stationery shop still sells manilla newspaper wrappers, long ledgers with marbled edges, fountain pen ink in Bank Teller's Black. Compasses and protractors, set squares. You expect to see a slide rule somewhere. Or Forms of Address for letters to a Dowager Duchess, a Writer to the Signet, a Colonial Bishop, or to Portcullis Pursuivant. We’d seen a sign on a wall by rusting railings. Lord Nelson may have passed through the garden that was once on this site, when he visited the town. We linger for a bit, wondering whether by some perichoresis, as in Machen’s ‘N’, the pleasaunce used for the Admiral’s constitutional might shimmeringly reappear. It doesn’t, but then you realise why. You’re already in a sort of perichoresis. The coarse and sordid has been charmed away in this place of quaint civility. It’s overlapped by the Olde Worlde. But in the charity shop, I haven’t found anything yet, whereas Mr Howard’s zeal is sustaining his interest longer. So I take another look. What’s this? 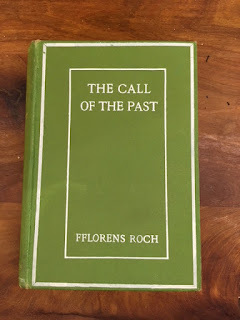 The Call of the Past. By Fflorens Roch. London & Edinburgh: Sands & Co. 1913. Flicker, flicker. Crumbs. A Welsh reincarnation fantasy. Jane Austen meets Joan Grant. ‘No, Mamma, I cannot marry the squire, for I am foresworn to a Druid priest, and am waiting for his return.’ ‘O, I never heard such nonsense. There’s no prospects in a parson.’ That sort of thing. I turn the pages in awe. Why didn’t I think of that before? I could have cast Miss Bennet as Cleopatra, Mr Darcy as Mark Anthony, Mr Bingley as Octavius, reaching across the ages. Wait, wait, what’s this. It gets better. ‘It is true, I can tell it only to you,” says another suitor, “I am from the island of Hy Brasil.’ So, there’s a mythic realm thrown in too. The lost paradise, the Eden over the seas, the Celtic Elysium. Earlier, in the town’s Old Books, I’d found a volume enticingly called A Lost Roman Road, A Reconnaissance in the West Country, by Bernard Berry, 1963. Maps in the back. 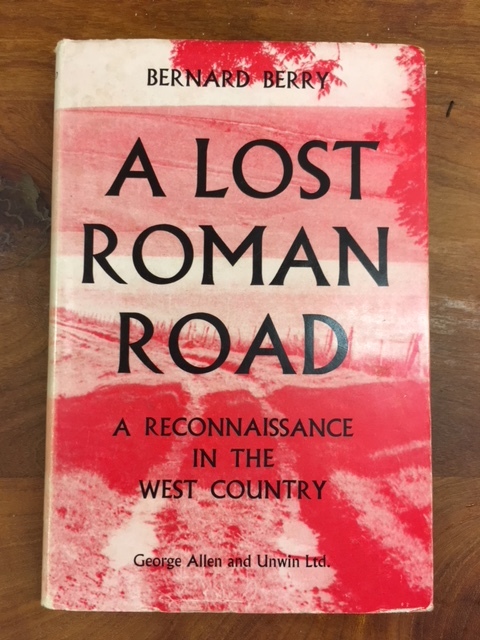 The author is in quest of the missing route between Bath and the Dorset coast, walking fields and footpaths, hills and hollows, looking for faint traces of straight lines, unexpected embankments, and more ethereal signs too. He goes where he wants, not worried about trespass. The locals think he’s from the Ministry, seeing about the electricity pylons, registering the footpaths, inspecting the land use. He doesn’t disabuse them. “Highly original”, eh? That sets my whiskers twitching. Publisher’s code for visionary, eccentric, idiosyncratic. Excellent. Just my sort of thing. File with ley lines, terrestrial zodiacs, genii loci, Black Horse inn signs. The author’s only book too, I later discover. 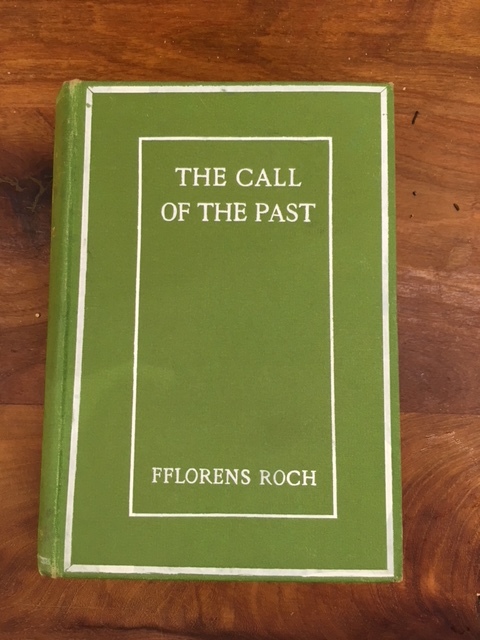 There is an affinity with Sarban’s ‘A House of Call’, also about a journey along a conjectured Roman road; and a touch of Buchan’s ‘The Wind in the Portico’. Yes, it’s strangely addictive, this journal of a wanderer in a Lost England after ancient ways. And he seems to discern the old signs so clearly too. Perhaps Mr Berry was a Roman surveyor in a former life. The town of Ross-on-Wye itself seems to be “taking part in an old rite and so bringing back, by the rite’s magic, the virtue of an older time,” as Sarban puts it in his story, about a circle of ghost-story-tellers. But you wonder how long the perichoresis can last. These two curious books are amulets of its lingering spell. We should start a subscription to keep Mark and John on the road for the next several months, provided we can receive in return such evocative postings from along the way. One small cx: Bennet needs another n.
perichoresis are about the Christian trinity. In what sense are you ising it here? I am profoundly jealous of Mr. Berry. If I could find a way to explore and wander that way and still maintain the bills, I might be tempted.